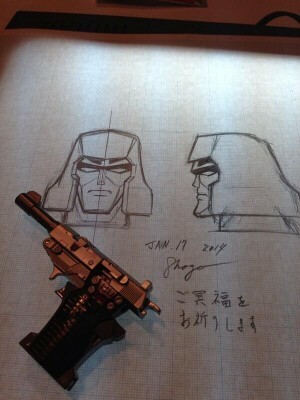 Shogo Hasui, the head designer of MP-10 and the following Masterpiece figures, tweeted this photo of the Reveal the Shield Legends Megatron on top of a sketch depicting a cartoon-accurate Megatron head, dated today, to pay respect to the passing of Seizō Katō, the Japanese voice actor for the character. Katō, who also played Galvatron in the series, died of complications of bladder cancer today at 11.40 am. He was also the voice of General Jark from my favourite Kamen Rider series Black RX. Did he also do the voice on that cartoon accurate Galvatron reissue? welcometothedarksyde wrote: Did he also do the voice on that cartoon accurate Galvatron reissue? TF Wiki says he did, yes Sadly I don't own that re-issue, even though I'd really love to. I was always under the assumption that Japan didnt get the animated series until the headmasters came out. Did this guy do voiceovers for the sunbow cartoons in Japanese ? I never seen translated versions before. Anyways may he rest in peace. Rated X wrote: I was always under the assumption that Japan didnt get the animated series until the headmasters came out. Did this guy do voiceovers for the sunbow cartoons in Japanese ? I never seen translated versions before. Anyways may he rest in peace. That doesn't make any sense. Of course Japan got the G1 cartoon. Why would the Japanese start on a series that would be a sequel to a show they didn't get before? That would be like saying if we didn't get Beast Wars in America until we got Beast Machines. Or like saying that George Lucas didn't make the first Star Wars movie until he made The Empire Strikes Back. A sequel can't be made if one doesn't even have what its supposed to be a sequel to. Japan imported the cartoon in 1985, one year after the US debut. The series was dubbed, edited, the episode order was scrambled and the first two seasons were merged into one single series: Tatakae! Chou Robotto Seimeitai Transformer. The third season was standalone and dubbed Tatakae! Chou Robotto Seimeitai Transformer 2010. After that came the Japan-only series. Back on topic, he was a prolific voice actor, in both Anime and Tokusatsu. May he rest in peace. Fight! Super Robot Lifeform Transformers (戦え! 超ロボット生命体 トランスフォーマー, Tatakae! Chō Robotto Seimeitai Transformers) began airing in 1985, consisting of the North American season 1 and 2 episodes. Although 2 episodes out of the original 65 were cut ("Attack of the Autobots" and "Day of the Machines"), an additional 9 clip shows were created, composed entirely of re-used footage taken from various episodes, bringing the total number of Fight! Super Robot Lifeform Transformers episodes to 72. The 2 missing episodes were later dubbed in 1990 and released straight-to-video, then retroactively added to the series episode list, boosting its official count to 74 episodes. 14. "Birth of the Transformers!" 56. "Desperate Battle on Dinobot Island"
57. "Devastator, the Giant Warrior"
72. "Mutiny of the Combaticons"
The broadcast order of the series was significantly reworked, with most of the episodes featuring Skyfire being pushed to the end of the run (presumably owing the character's shaky status as a Bandai toy in Japan). Contrary to what would be sensible, this did not involve correcting any of the chronological errors present in the original order; in fact, it even created some new ones. The pack-in booklet included with the laserdisk and DVD sets from Pioneer feature a "narrative viewing order" list. Perhaps most notoriously, the episodes were edited before their broadcast in Japan. These edits were made not for content, but for length so that the show could accommodate longer opening and ending sequences. The combined length of the U.S. opening and ending sequences was about 1 minute and 10 seconds. The combined length of the Japanese opening and ending sequences, however, was about 2 minutes and 20 seconds. This resulted in roughly 1 minute and 10 seconds of content being cut from every single episode. The translation in terms of script and story was faithful in regards to the original English version (the same cannot be said of the translations of Beast Wars and onward). However, the dub was at times rushed and had its own unique errors, primarily in terms of matching the right voices and names to the characters on screen. Some examples of character identification mistakes include "More than Meets the Eye, Part 3", in which it is Thundercracker who requests permission to teleport and attack Ironhide, and "Divide and Conquer", where Starscream voices the teleporting Seeker rather than Skywarp (as a result, to Japanese viewers, it appears as though teleportation is a trait inherent in all Seekers and not just Skywarp). One of the worse examples would come in "The Master Builders", as Megatron orders Blitzwing into battle, though the jet is clearly Ramjet (Ramjet is even dubbed with Blitzwing's voice). Although primary characters such as Megatron, Optimus Prime, Bumblebee, etc., had consistent actors, the dub was extremely loose in terms of casting its secondary characters. Bluestreak, for example, had no less than seven different actors portray him over the course of the series (though Kōki Kataoka is typically credited as his "standard" voice actor). By the looks of things, if a secondary character only received one or two lines in a given episode, then whatever actor was on hand in the studio would be called in to play them, consistency be damned. Additionally, the Japanese dub of Transformers was geared toward a younger audience than the original English version. While the dialogue and stories remained faithful in localization, the episodes received extensive narration from Issei Masamune. The additional narration was relentless to the point of becoming play-by-play commentary. The narrator would constantly describe what was happening on screen, summarize scenes and dialogue immediately after they were seen or spoken, and generally just provide needless asides such as "And then!" "Suddenly!" and "Meanwhile!" This was done to help the younger Japanese viewers follow along with the story, though later domestically produced Japanese Transformers animation would not include such excessive narration. Fight! Super Robot Lifeform Transformers aired on various local Nihon TV affiliates and as a result, some episodes were preempted in some areas ("The Golden Lagoon", for example, only aired in the Kansai region, while "The Girl Who Loved Powerglide" aired in every region but the Kansai region). The opening theme was "TRANSFORMER" by Satoko Shimonari and the ending theme was "Peace Again" also by Shimonari. Fight! Super Robot Lifeform Transformers 2010 (戦え! 超ロボット生命体 トランスフォーマー 2010, Tatakae! Chō Robotto Seimeitai Transformers 2010) began airing in 1986, consisting of the North American season 3 episodes. All 30 episodes were dubbed for Transformers 2010 and 2 additional clip episodes were produced, bringing the total to 32 episodes. 30. "The Desperate Struggle of Justice"
As with Fight! Super Robot Lifeform Transformers, Transformers 2010 considerably reordered the sequence of episodes. However, rather than restore the narrative order (as the North American broadcast had jumbled up the story arcs), the Japanese broadcast actually made things worse. And as with Super Robot Lifeform Transformers, Pioneer's laserdisk and DVD sets for Transformers 2010 include a "narrative viewing order" list in the pack-in booklet. Transformers 2010 received the same editing treatment as its predecessor, losing scenes to make room for the longer title and credits sequences. Likewise, it received all the excessive narration and was prone to the same rotating cast members and character identification hiccups. In regards to the latter, it could become especially problematic when the narrator was the one misidentifying the characters (in "The Burden Hardest to Bear", the narrator mistakenly identifies Wildrider and Dead End as Runabout and Runamuck). In addition to the extensive narration to hold the viewer's hand, Transformers 2010 also received brand new text captions which had not been often utilized in Super Robot Lifeform Transformers. These captions would appear on screen to designate locations (be they planets, countries or cities) and to identify new characters whenever they first appeared (including both names and functions). The Secret Files of Teletraan II segments were also reworked; some were dubbed, some were dropped and some brand new ones exclusive to Transformers 2010 were created. The release of The Transformers: The Movie was delayed in Japan and was not available between Fight! Super Robot Lifeform Transformers and Transformers 2010. To help viewers acclimate to the new status quo, explanatory material was published in the pages of TV Magazine, describing the events of The Movie as the "Unicron War" and summarizing vital events from the film (such as Optimus Prime's death, Rodimus Prime's ascension and Megatron's upgrade into Galvatron). The Movie would eventually be released straight-to-video in 1989. Like Fight! Super Robot Lifeform Transformers, Transformers 2010 was broadcast on various local Nihon TV affiliates, resulting in preemptions in certain areas ("The Face of the Nijika" for example). The opening theme was "TRANSFORMER 2010" by Shō Hirose and the ending theme was "WHAT'S YOU" also by Hirose. The season 4 episodes of The Transformers were not originally broadcast in Japan, with Takara instead electing to produce a brand new series to continue the story of their animated continuity: The Headmasters. However, all 3 episodes were eventually released straight-to-video in 1996 as Transformers: The Rebirth (トランスフォーマー ザ・リバース). The episodes received their much-belated Japanese television broadcast in 2007 on Cartoon Network Japan. To differentiate "The Rebirth" from the Japanese continuity of Fight! Super Robot Lifeform Transformers, the episodes were released under the American The Transformers branding. To further this distinction, the dub used standard English-language names and terminology for the most part ("Hot Rod" was not changed to "Hot Rodimus" and "Kup" was not changed to "Chear", for example) while maintaining the Japanese-exclusive names for the more high profile characters ("Convoy" was not changed to "Optimus Prime", for example). Only three actors from Fight! Super Robot Lifeform Transformers and Transformers 2010 returned to voice their respective characters: Tesshō Genda (Optimus Prime), Seizō Katō (Galvatron) and Issei Masamune (narrator). Every other cast member was replaced with a soundalike, to varying degrees of success. The voice direction for these episodes was conducted by Shōzō Tajima.